Background: Acne vulgaris is a common dermatologic disorder which results in psychological consequences. Inflammatory responses play an important role in the development of inflammatory acne lesions. Recently, many studies have demonstrated anti-inflammatory effects of statins; thus, the aim of this study was to evaluate the efficacy of oral and topical Simvastatin as adjunct therapy in the treatment of acne vulgaris. Methods: A total of 76 patients with moderate to very severe acne vulgaris, all receiving oral azithromycin (250 mg, 3 times a week, orally) and topical benzoyl peroxide gel (5%, once daily) were assigned to three groups: 1) Oral group received 20mg/day of oral simvastatin and blank solution, 2) Topical group received simvastatin 1% topical solution and oral placebo, 3) Placebo group received oral placebo and blank solution. The severity of acne was determined by global acne grading system (GAGS) at baseline and after 8 weeks of treatment. Results: Comparing the three groups showed that topical simvastatin was associated with greater decrease in acne severity as compared with those of oral and placebo groups. Moreover, the oral simvastatin appeared to be more efficacious as compared with placebo group (P value<0.001). Oral and topical simvastatin were well tolerated in almost all patients. 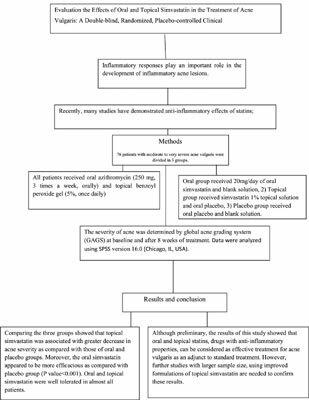 Conclusion: Although preliminary, the results of this study showed that oral and topical statins, drugs with anti-inflammatory properties, can be considered as effective treatment for acne vulgaris as an adjunct to standard treatment. However, further studies with larger sample size, using improved formulations of topical simvastatin are needed to confirm these results. Keywords: Topical and oral simvastatin, acne vulgaris, anti-inflammatory effects, pathophysiologic pathways, NFκB, Propionibacterium. Keywords:Topical and oral simvastatin, acne vulgaris, anti-inflammatory effects, pathophysiologic pathways, NFκB, Propionibacterium. Abstract:Background: Acne vulgaris is a common dermatologic disorder which results in psychological consequences. Inflammatory responses play an important role in the development of inflammatory acne lesions. Recently, many studies have demonstrated anti-inflammatory effects of statins; thus, the aim of this study was to evaluate the efficacy of oral and topical Simvastatin as adjunct therapy in the treatment of acne vulgaris.